Breakfast carbonara: Morning After, West End. Have a limited time to explore Brisbane and only want to eat the best? We’ve narrowed down a selection of the city’s best dishes, from breakfast carbonara (yes, it’s true) to salted-caramel-crowned cronuts. Arguably one of the best-known dishes in Brisbane, 1889 Enoteca’s ridiculously rich gnocchi has been the restaurant’s bestseller for seven years straight. When the weather gets cool, head to this moody Roman-style trattoria, housed in an elegant heritage-listed space, for handmade gnocchi, folded with truffle and Parmesan cream, and fennel-flecked pork sausage. Gnocchi with pork and fennel sausage, 1889 Enoteca. The dish begs for a good glass of vino and, happily, the restaurant happens to have one of the best wine lists in town. In the back corner of a strip of shops off a main road, Flour and Chocolate is a low-key store than serves up some of the city’s best patisserie. Owner Lachlan Scott has perfected the classics and can turn out beautiful special-occasion cakes, but the daily specials are your target. The gonut (a version of the croissant-doughnut hybrid, the cronut), Flour and Chocolate. On Thursday, he does gonuts (a version of the croissant-doughnut hybrid, the cronut) and bronuts (brioche doughnuts), and crowd-sources flavour ideas via Facebook. Think delicate layers of croissant pastries, fried until crisp, and topped with white chocolate and pistachio, or sandwiched with vanilla custard. The diet can start tomorrow. The wings game is fierce in this city, but this little food truck punches above its weight. Crowds start to line up as soon as their bright orange van pulls up and starts pumping R’n’B tunes, making for an instant street-party vibe. Bee sting wings, King of the Wings food truck. The best place to track the truck down is at Green Beacon Brewing Company in Teneriffe for Wing it Wednesdays, so you can park at the bar with a beer while you wait for your order to cook. The custom-blended chillogy (a fusion of three chillies) stands in for standard buffalo sauce, or you can order Bee Sting wings, smothered in honey, sesame and chilli. If you prefer a dry-rub, the Southern spice or Portuguese crumb rubs are also excellent, but make sure you get a drizzle of ranch on top. Bow down to Brisbane’s undisputed ramen king. 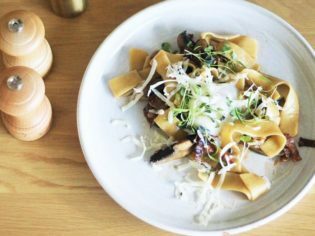 Formerly in the city, this casual-style ramen shop holds an unassuming position on Racecourse Road, with bare tables and a basic fit-out, save for the new addition of tableside touchscreen ordering. Chicken karaage and gyoza make excellent sides, but keep your eyes on the prize: the ramen. Taro’s noodles are made by hand in-house, and shoyu and shio ramen are both based on ‘golden triple soup’ (a blend of chicken, seaweed and vegetable) but the tonkotsu ramen is really special. Bangalow sweet pork bones are slow-simmered for two days to create the rich, cloudy soup, which comes topped with two slices of char sui pork, soy-cooked soft egg and nori. Add in some pickled ginger to cut through the richness, and, if you’re a heat-seeker, go for the fire tonkotsu, with four types of chilli added in. If you need a greasy ‘morning after the night before’ style snack, make a beeline for cult-status burger bar Ze Pickle, housed in a grungy, hidden industrial space, near the flashy Emporium precinct. You’ll need an order of sweet potato fries and a craft beer while you pore over the OTT menu. Any of the burgers at Ze Pickle. The aptly named 3am burger piles fried cheese sticks, maple-smoked bacon and guac onto a hand-pressed wagyu patty, while the Triple Loco really takes things out of hand, tripling the bacon, cheese and patty count, adding on pulled pork and replacing the buns with grilled cheese sandwiches. Phew. In all honesty, we should be recommending a plate of charcuterie with a little dry fino sherry from stellar Fortitude Valley bar Gerard’s, hidden in a carpark behind James Street. That’s what will catch your eye first, as you walk past the huge entryway cabinet of carnivorous delights, where a staff member will be slicing to order and piling plates with pickles and bread. But down the other end of the narrow bar, chefs use blowtorches to sear the burger patties and carefully layer them with cheese and pickles. The burger is on the small side but perfectly constructed with just patties, pickles, cheese and sauce: a winning argument in burger simplicity. And you can take the charcuterie as a side. Why has no one thought to serve pasta at breakfast before? Carbonara is a natural extension of bacon and eggs with toast: pappardelle provides a dose of carbs, guanciale (cured pigs cheek) adds that meaty umami hit, and a 63-degree hens egg stands in for the requisite yolk. If you are having one of those morning-after moments, bring a pair of shades to Morning After. 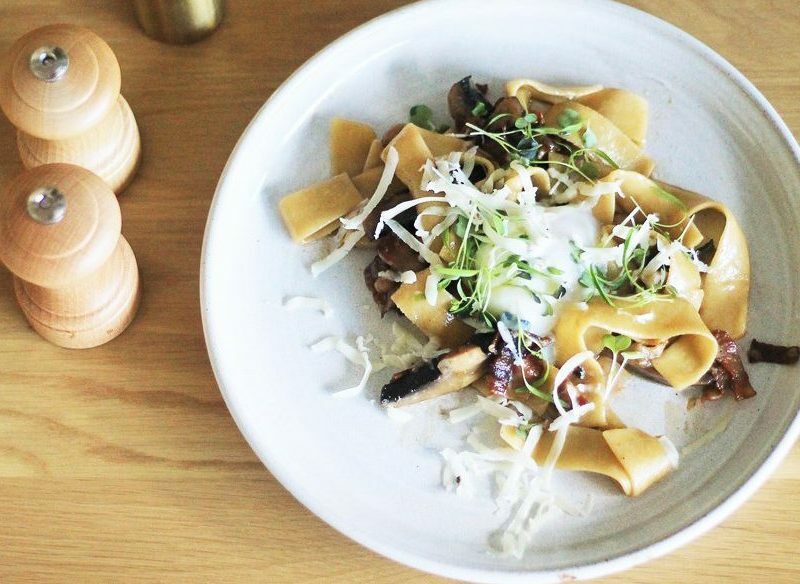 The all-white, timber and green cafe is bright and breezy, but a bowl of that pasta will have you feeling human in no time.